This is the citrus salad at Altro Paradiso; it is utterly irresistible. 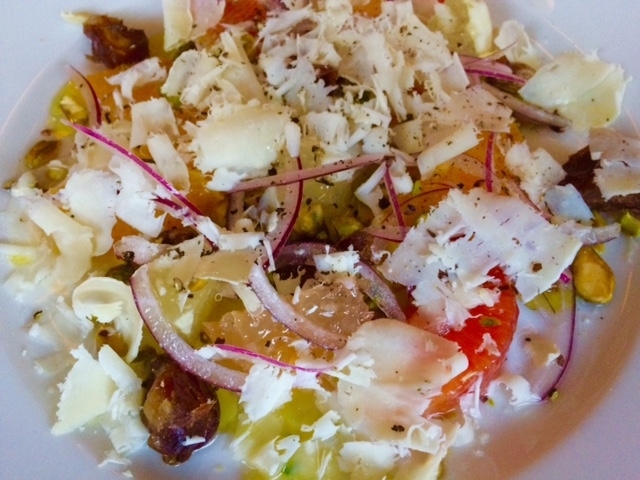 Blood oranges, a bit of red onion, aged pecorino, dates, pistachios… I was so sorry when the plate was empty. 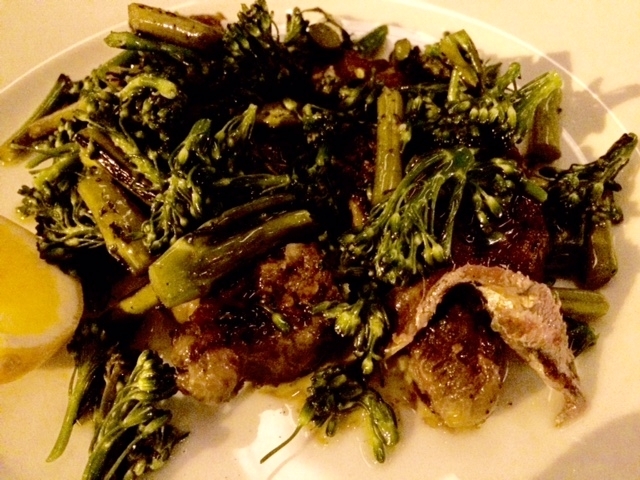 This was my other favorite dish at Altro Paradiso (the newest outpost of the Estela gang): sliced ribeye splashed with lemon and framed by the slight bitterness of broccolini. And went on to the clean, refreshing taste of fluke. 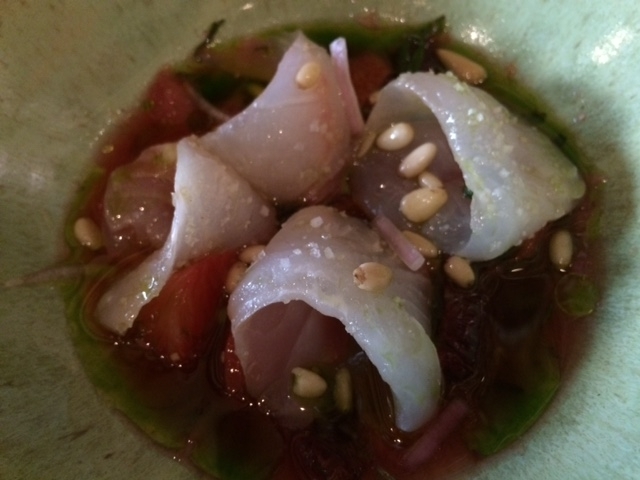 The delicate little petals of fish, sparkling with just a touch of salt, reveled in their citrus bath. Those rich, soft pinenuts, so smooth beneath the teeth, added a riveting textural contrast. But the big surprise of the week was this gorgeous pizza bianca at Bonfiglio in Hudson New York. How did the crust contrive to be both crisp and floppy at the same time? 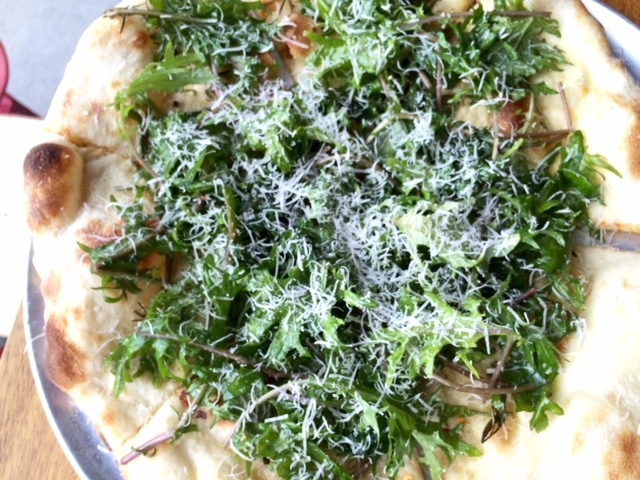 The arugula was dressed with the lightest hand and the result was so delicious I was reminded of something Alice Waters might have made when she first opened the Cafe at Chez Panisse. 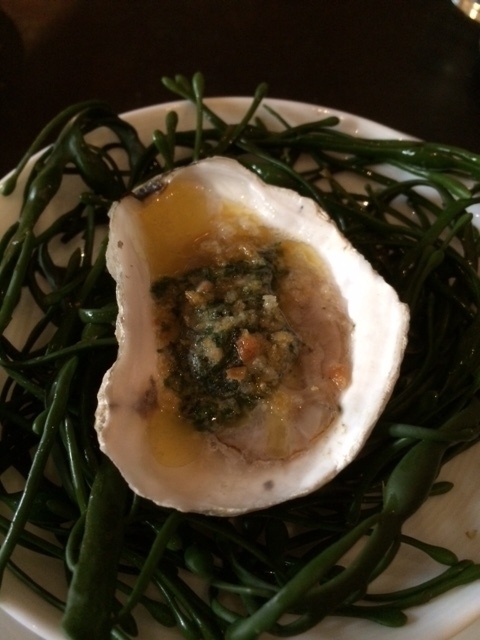 Writing about it in Tender at the Bone, I called the restaurant where I learned to waitress “L’Escargot”. But it was, in reality, La Seine, and it was one of the most extraordinary restaurants I’ve ever encountered. It was a dream of a place, that tried to offer the best of everything to a city unprepared to dine on Limoges or drink from Baccarat. As I remember it – can this be true?- the silver chandelier had once belonged to the Prince of Wales. 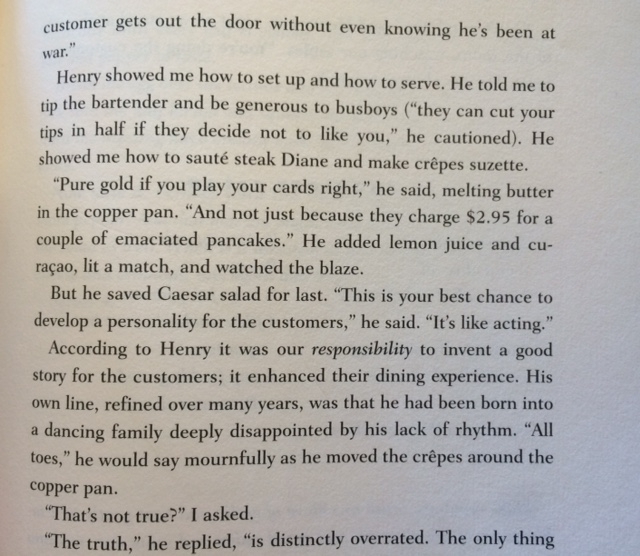 The chef was “a real Frenchman” who had worked with the legendary Henri Charpentier (who invented crepes Suzettes and wrote a wonderful autobiography, Life a la Henri). The grill man, another pro, came from Detroit’s London Chop House. The minimum wage at the time was $1 an hour (which is what I earned at my other job shelving books in the University of Michigan library), but I took home $35 every night I worked at La Seine. No wonder I loved that restaurant. 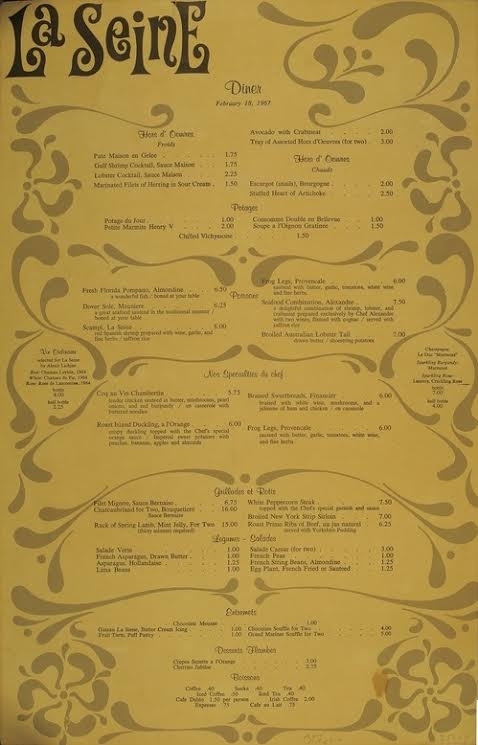 Here’s the menu; that Dover Sole at $6.25, by the way, was the real thing. An entire fish, which we boned at the table. Feeling totally indulgent on this radiant morning, I was heading off to Gray’s Papaya. Nothing makes me more aware of how lucky I am to be a New Yorker than a walk along the river with a crisp, skinny hot dog slathered with onion sauce in my hand. But a wonderful aroma was wafting through the apartment, and I found Nick in the kitchen, stuffing kale, lemons and ginger into the juicer. It smelled so delicious it stopped me in my tracks. 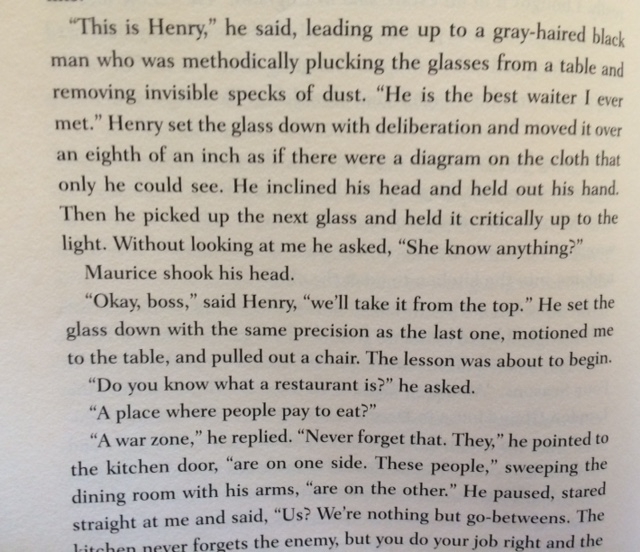 “Try it,” he said, holding out the glass. I’ll have a hot dog tomorrow. Whirl into a liquid and drink with enormous pleasure. 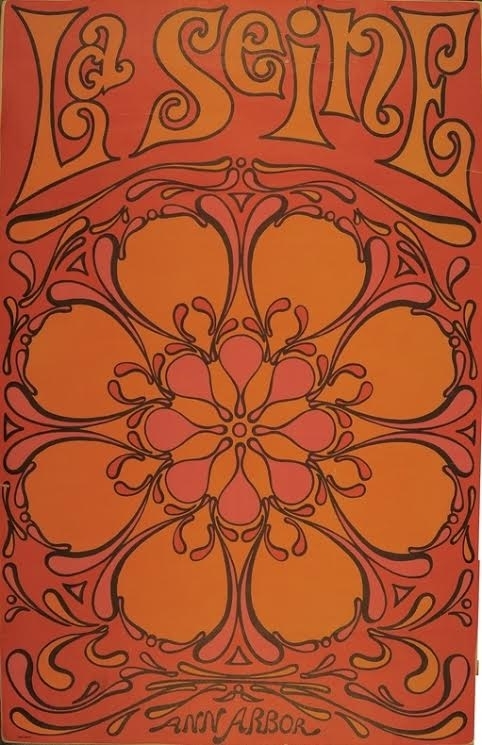 When I came upon this book in the Fales Library I was reminded of the garlicmania of the seventies. For most of our history, the United States was a nation that feared garlic. 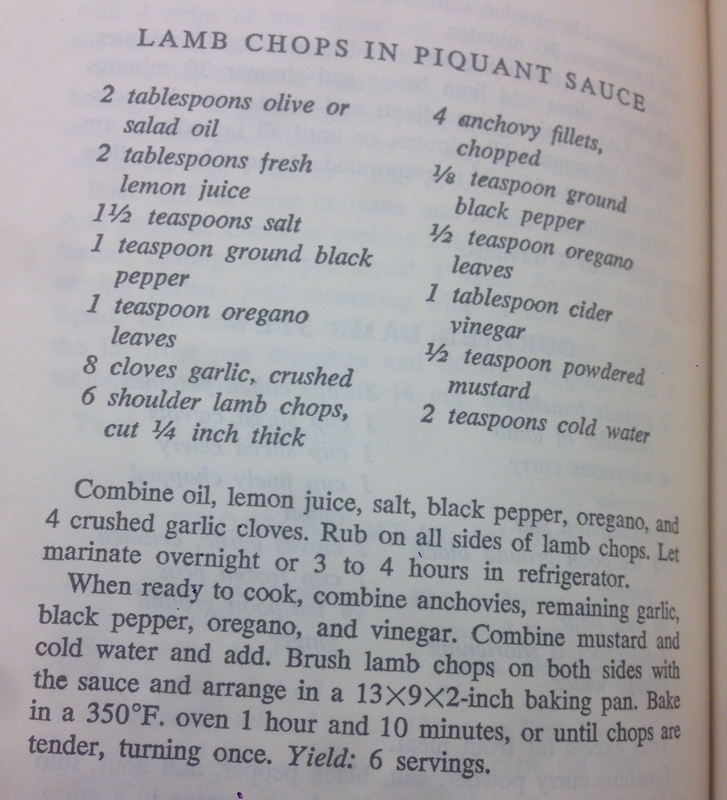 (Early Gourmet recipes had you suspend a clove of garlic in the salad dressing for a minute, then remove it. And a turn of the century ditty began, “A nickel will get you on the subway, but garlic will get you a seat.”) One aspect of the Berkeley food revolution of the seventies was a valiant attempt to restore garlic to its rightful place in the kitchen. Wash the spinach well and drain it in a colander. Put half of the spinach, with water clinging to its leaves, in a heavy pot and cook over a moderate heat, covered, stirring occasionally, until slightly wilted, about 1 minute. 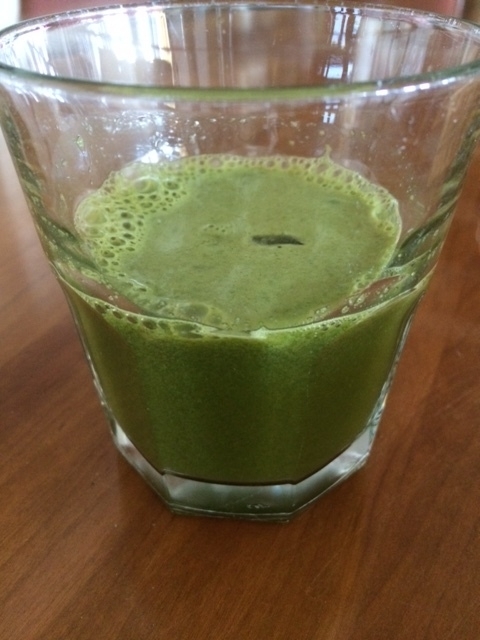 Add the remaining spinach and continue to cook over moderate heat, covered, stirring occasionally, until wilted but still bright green, about 1 minute more. Drain the spinach in a colander. When the spinach is cool enough to handle, squeeze it dry in small handfuls and chop finely. Melt the butter in a large, deep, heavy skillet over moderate heat until foam subsides. Cook the onion in the butter, with salt and pepper to taste, stirring, until softened, about 8 minutes. Stir in the garlic and cayenne and cook, stirring, for 2 minutes. Add the cheese and cook over moderately low heat, stirring, until the cheese is melted and all the ingredients are combined. Season the mixture with salt and pepper and spread in a well-buttered shallow baking dish. Sprinkle the top evenly with bread crumbs and bake in the middle of the oven until golden brown on top and bubbling, 20 to 25 minutes. 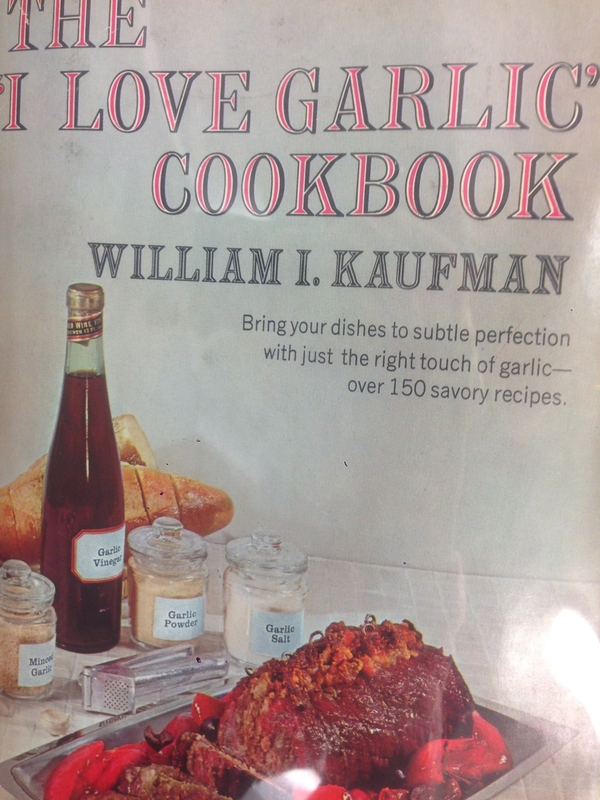 I’ve got lots of garlic memorabilia, like my friend John Harris’s cookbook: The Book of Garlic. I still use it all the time. But the garlic book above is new to me, and poring through the recipes, I came upon this instantly appealing dish (although that cooking time is insane). What made me do it? Not quite sure. I know better than to think turkey meatballs are going to be great. 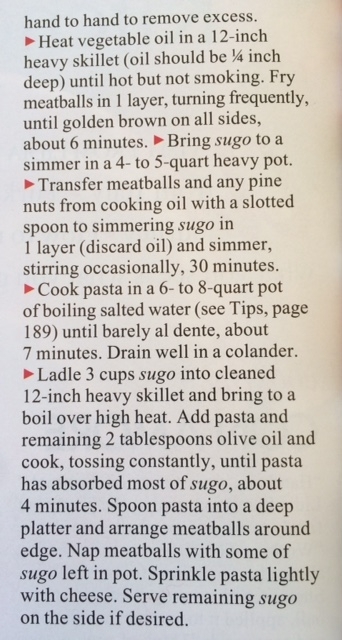 Yesterday, as I was working on the memoir about the Gourmet years, I came across this recipe we printed in the TV issue in 2004. Lydia Bastianich came into our kitchens at 4 Times Square, to demonstrate the dish. I didn’t really remember it, but now, intrigued by the inclusion of pine nuts and golden raisins, I decided to make it. Let me begin by saying that the start to finish time is a lie. There’s no way you can do this in an hour. The truth is, we often fudged the timing on recipes; if we told you that it was going to take two hours, would you really embark on the project? Let me also say that it’s a rare Gourmet recipe that lets you down. And in all honesty, I liked the ragu quite a lot: it is full of flavor, and thin enough to allow the pasta to inhale the sauce, soaking it up until it is literally part of the pasta. But the meatballs…. I wouldn’t make them again. 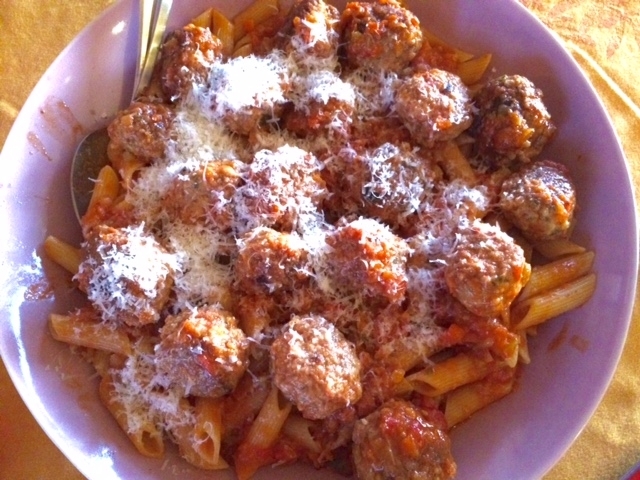 When I make meatballs, I want airy spheres that evaporate beneath your teeth, whispering lemon, sighing parmesan, each bite leaving an echo in its wake. 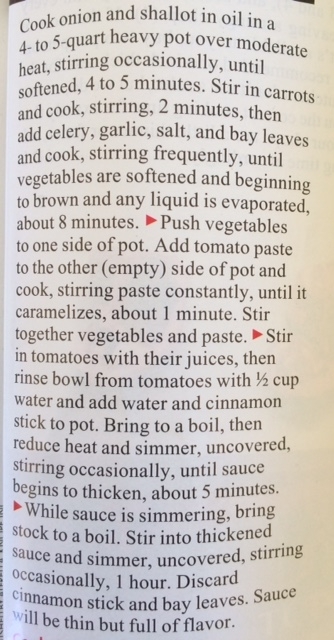 A simple sauce that sings tomato. A dish that rewards your effort by arriving at the table wreathed in joy, eager to make everybody happy. “You always say that,” Maggie replied. In this case, I was right. 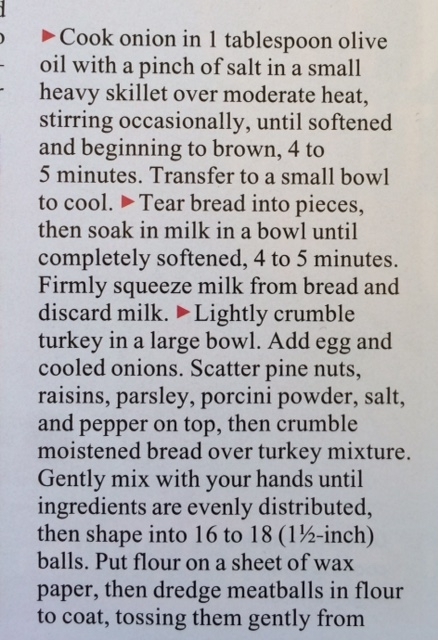 This is a recipe that is worth your time.